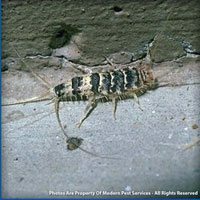 Adult firebrats not including tails can reach up to 1/2 inch in length. Color is grayish or grayish with dark markings. Firebrats prefer areas of high humidity, but temperature is a key factor. Firebrats can be found in areas of 90 degrees or more. The best places to look for them are in or near boiler rooms, bakeries, attics, steam tunnels, ovens, hot water heaters, etc. Firebrats feed on carbohydrates and proteins. They will also attack paper, linen, cotton, silk and other materials. Females will lay about 1-3 batches of eggs (50-eggs per batch) in cracks and crevices. Firebrates usually live 1-2.5 years.